Designed exclusively for Wagamama, our bespoke children's wooden stacking restaurant high chairs have been a roaring success with young visitors to the popular noodle chain all across the UK. Having taller tables than the regular 75 cm height meant Wagamama were using a combination of solutions to get their toddler customers around the table with their families. They included stacking one chair on top of the other, a clip-to-table (and a long drop to the floor) design and various things in between. 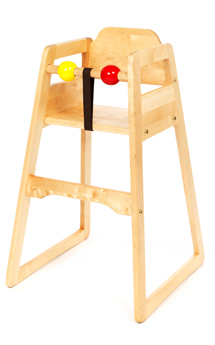 Now the bespoke chair, complete with black and red toy balls to match the Wagamama brand, slides right up to the taller table height for a seamless family eating experience. Yes you heard right. "A seamless family restaurant experience...."